"Now you're just showing off." That's about what we think which every single TV spot that comes out for The Dark Knight Rises, but we're not going to feature each and every one, so don't worry. But this new spot was too awesome to ignore with an exchange between Joseph Gordon-Levitt's new character and Gary Oldman as Commissioner Gordon, and a couple of great moments between Bruce Wayne (Christian Bale) and Lucius Fox (Morgan Freeman), including one that calls back to Batman Begins. 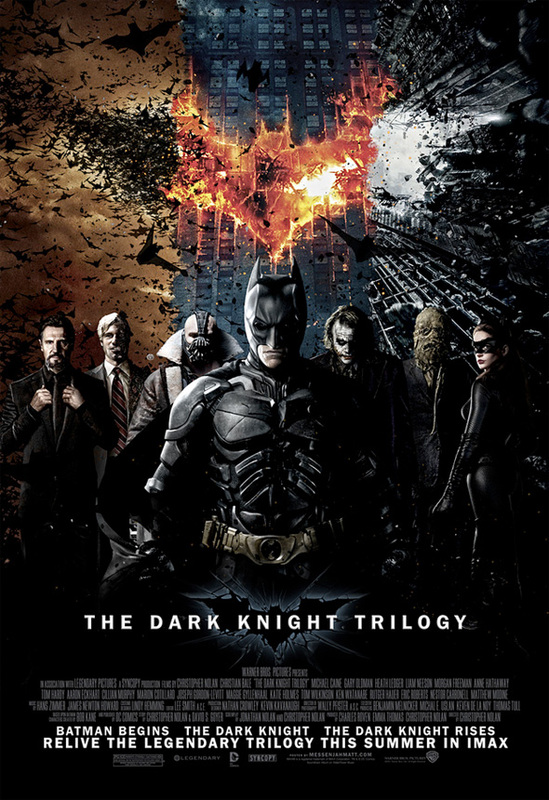 Plus, an awesome fanmade poster commemorating Christopher Nolan's trilogy has surfaced. Check them out below! saw a different posters with the characters associated with the respective movies they appeared in. That is an awesome poster! Cudos to the person who made it! Can't wait for the movie! ^Ok that's pretty damn awesome! Great poster they should really make this poster and sell it! I would buy the 27 by 40 Double sided version of this poster for sure! http://www.messenjahmatt.com/thedarkknightrises/posters/TDKRPoster29.jpg Here's the villains in their correct positions. am i the only one who noticed there seems to be TWO villains in each movie? and if Michael claims Catwoman isnt a true enemy...then who it number two? OMG OMG OMG OMG OMG OMG OMG MUST.......NOT...........WATCH.........ANY....MORE.......FOOTAGE...... ONLY......35.....MORE.....DAYS!!!!! DAMN!!!!!!! "clicks on the video"